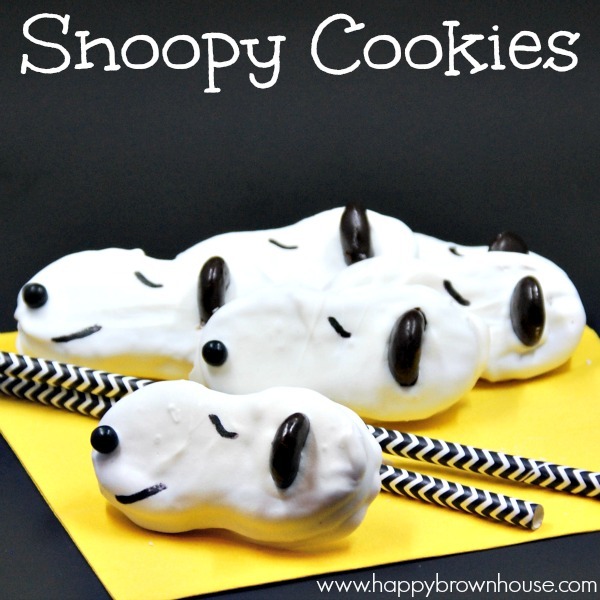 My kids love Charlie Brown and his lovable dog, Snoopy, so much that these Snoopy Cookies were a hit at our house! The Peanuts gang has always been a part of my childhood, whether it was watching A Charlie Brown Christmas, A Charlie Brown Thanksgiving, or It’s the Great Pumpkin, Charlie Brown. Over the years, we introduced these beloved Charlie Brown cartoons to our boys and they love them just as much as we do now. Our 4 year old has been especially smitten with Snoopy, so I made these as a surprise for him while he was away. I only wish I had taken a video of his reaction! 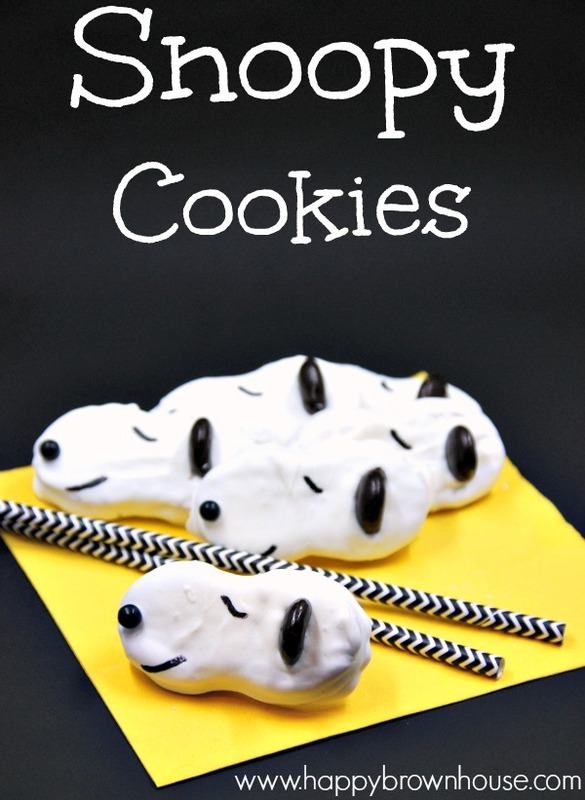 If you have a Snoopy lover in your gang, I’m sure these Snoopy Cookies will hit the spot. There is a video tutorial at the end of this post, so be sure to watch it to see how easy these are to put together. Want to learn more about the creator of Peanuts? Check out this Charles Schulz Unit Study! Enjoy these adorable cookies made to look like the lovable character, Snoopy, from the Peanuts gang. 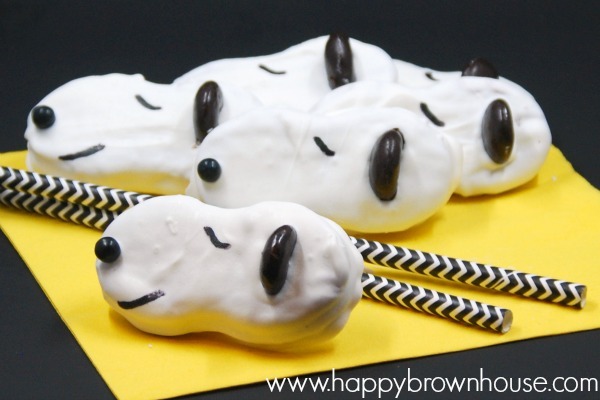 They're quick and easy to make and are perfect for the Snoopy lover. Microwave the candy melts in a bowl according to the package instructions until the candy coating is smooth. Dip the Nutter Butter cookies into the melted candy coating, turning the cookie over and covering all sides. Gently shake excess coating off by tapping on the bowl gently. While the candy coating is still melted, place a black candy pearl on one end of the cookie for Snoopy’s nose. Cut about 1/3 off of the Junior Mints so that you have a straight surface to attach the mint to the other end of the cookie for Snoopy’s ear. Let the cookies sit while the candy coating hardens. Using the black Food Decorator pen, make the lines for Snoopy’s eye and mouth. Want to watch me make the Snoopy Cookies?